Who will you vote for in Shadow Election India? 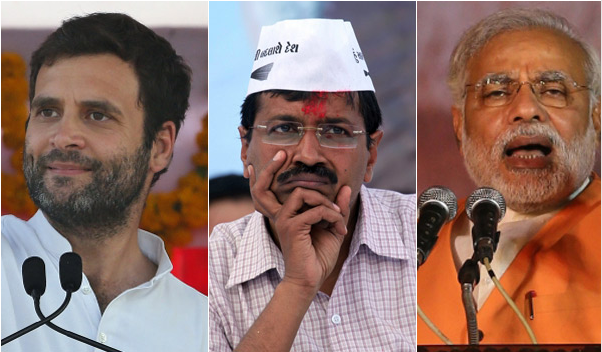 Which one of these main players are you going to cast a virtual vote for in Shadow Election India? We just launched Shadow Election India in time for the final sprint before the last voting day on 12 May. More than 800 million Indians will go to the polls in the world's largest voting event; a process which takes 5 weeks (7 April to 12 May) to complete. The main reason it takes so long is because a federally formed security entity has to move around the country ensuring fair and violence free voting. Find out more about this in a recent BBC article: Why does India's election take so long? India will also be using a electronic voting system, and it will be interesting to see how it goes. It would have been great for Shadow Election to be running for all the regional voting activities too, however, given our limited volunteer resources, we decided to focus on the three most likely prime ministerial candidates. Everyone in the world should care and show an interest in other countries' national elections because every successful election is a victory for human resourcefullness in avoiding violent conflict and ensuring better governance. We wish India the very best in this final stretch of the elections, and may you continue to set an example to the world by showing that a workable democracy is achievable no matter what the odds. Find out more about the candidates and cast a virtual vote in Shadow Election India!